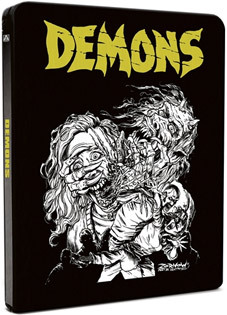 Arrow have announced late April special edition DVD and Blu-ray releases of of Demons and Demons 2, two 80s cult horror favourites from director Lamberto Bava	and producer and co-writer Dario Argento. Both were previously released on DVD only with similar extra features, but are getting their first UK Blu-ray outing here with remastered transfers from the original camera negatives. In a mysterious cinema, an audience are watching a brutal horror flick when the horror rips out of the screen, unleashing a swarm of slathering Demons who are intent on spreading their evil plague across the globe. Time to tool up and take no prisoners... The Demons are coming! Lamberto Bava and Dario Argento bring you THE Gonzo Horror movie of the 1980s with Demons, a frenzied slice of gore heavy shock cinema that gives up on logic and instead assaults the screen with a riot of X-Rated violence, face chewing Zombies and pounding Heavy Metal. Collector's Comic: Demons 3 Part 1 of 2! Not The Ogre. Not The Church. Not even Black Demons! For the first time ever, Arrow Video presents an original sequel to the cult classics. Watch as a teenage birthday girl ruins the party by eating her guests, see bodybuilders torn to shreds and tremble in terror as possessed children run amok. Will anyone survive or will the Demons rise once more and destroy us all? The Demons are back! Unleashed through the TV and bringing Hell direct to your Living Room. Out of the dark Forbidden Zone, the world's ugliest zombies are causing carnage in an apartment block, eating the residents and spreading their deadly plague. Bava to Bava: Luigi Cozzi tracks the history of the Italian horror film, from Riccardo Freda and Mario Bava to the end of the golden age with Michele Soavi and Lamberto Bava as well as considering recent Italian horror films. Collector's Comic: Demons 3 Part 2 of 2. Both films will be released individually on UK DVD and Blu-ray by Arrow Films on 30th April 2012. If you pre-order directly from Arrow the RRP if currently £11.99 per DVD and £16.99 per Blu-rays (it's a price you'll also find elsewhere if you look around). You can also by a steelbook edition containing the Blu-ray editions detailed above of both Demons and Demons 2 for £26.99 (again direct from Arrow). You'll also find other deals on the Arrow site that include t-shirts in the package as well.